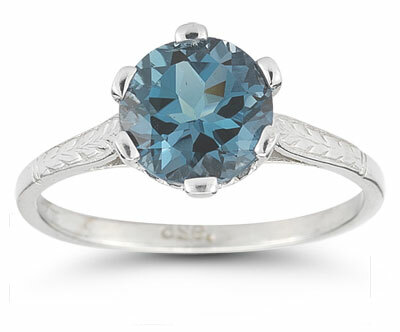 Even a deep blue sea is no match for the beauty of this London blue topaz gemstone ring. Apples of Gold presents a scintillating London blue topaz stone, perfectly set in solid 14K white gold. The gemstone is round cut and shimmers as light reflects off the carefully carved facets. A setting of six prongs holds the gemstone secure and offers a lovely heart cutout, too. The band gleams with a beautiful polish and engraved leaf pattern on both sides. We guarantee our Vintage Leaf London Blue Topaz Ring in 14K White Gold to be high quality, authentic jewelry, as described above.